Go Back to the Homepage / Radioactive Saliva? I-131 is taken up not only by thyroid tissue, but also some other tissues in the body such as salivary glands. Your saliva can be one of, if not the biggest source of contamination. Saliva contains greater concentrates of I131, much more than urine. Since your saliva is so highly radioactive, your bathroom sink needs special attention. This is also particularly true because other family members are likely to come into contact with any contamination left in the sink. 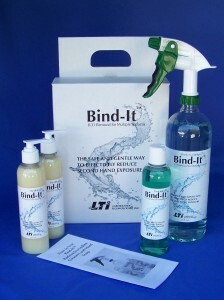 Thoroughly spray and wipe down the sink with Bind-It™. Also clean the toothbrush holder, and dispose of your toothbrush once the isolation period is over. We recommend storing the old toothbrush with the “hot” paper towels you accumulate from cleanup. The toothbrush has the potential to be radioactive enough to possibly set of alarms at the garbage dump. If this happens, it could result in fines for you.